BT Series Single Speed A.C. soft start, reduced torque control. Now for applications with motor sizes up to 75 HP! Upgrade your crane with smooth starting, reversing, and jogging; as well as more precise spotting and inching. Through the control of all 3 phases for reduced mechanical and motor stress, you can practically eliminate breakage and wear on drive trains, gearing, belts, etc. The BT Series Smooth-Move will help increase the life, reliability, and productivity of new or existing motorized equipment such as: Conveyors, Overhead Crane Bridge/Trolleys, Monorails, Textile Machines, Turntables, Bottling Equipment, Palletizers, Overhead Doors, etc. BT Series Single Speed A.C. soft starts can replace resistor ballasts, timers, fluid couplings, inductors and other electrical and mechanical systems used to “cushion start” 3-phase induction motors. The controller can be used with single or multiple motors up to the total full load amperage rating of the model (see table below). Smooth reversing is accomplished with a reversing contactor. The BT Series Smooth Move allows you to adjust the starting TORQUE of the motor, along with the length of TIME to reach full motor torque. 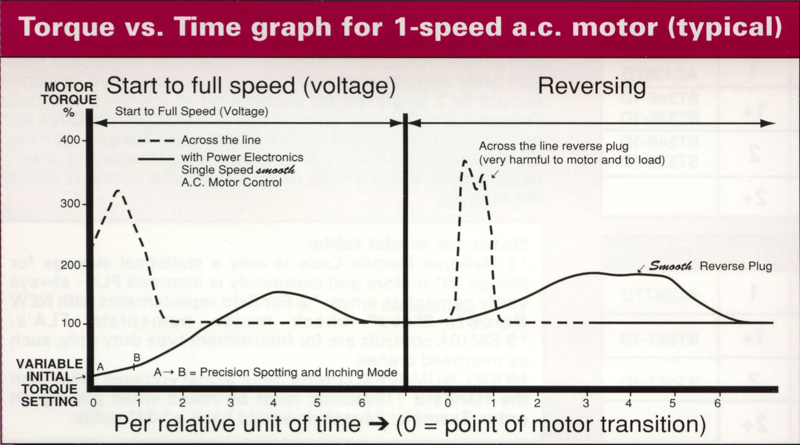 With these two adjustments it is possible to softly control the starting characteristics of the motor (see comparison graph of motor starting characteristics with, and without the Smooth-Move® 1 installed). Instead of a harsh instantaneous inrush current, the control will gently adjust the motor up to full line voltage. For two-speed A.C. motor soft-start control in the 7.5-75 HP range, view the BT-Series® Dual Speed. For applications with lower full load amp requirements (10 Amps and Under), see the Smooth Move series soft-starts.